16 posts categorized "Korean Adoption"
From yesterday's Angry Poetry Corner on Angry Asian Man, here is a snippet from a poem entitled "How to Tell if a Korean Woman Loves You" by Christy NaMee Eriksen, a Korean Adoptee based in Juneau. That speaks volumes, doesn't it? Just letting you inside the kitchen is a big step. For channeling William Carlos Williams' knack for imagery and reminding me that I should read some more poetry, I hereby nominate Christy to the Kimchi Mamas Honor Roll. More of Christy's poetry can be found at her blog, Tsunamee. Really, really good stuff there. I had the privilege of watching the film In the Matter of Cha Jung Hee at the San Francisco International Asian American Film Festival last month. Deann Borshay Liem produced and directed the film and it's sort of a follow up to her first film, First Person Plural, which is a documentary film about her experience as an international adoptee. The auditorium of the Pacific Film Archive in Berkeley was packed for this world premiere. The audience was very diverse and a group of Korean American adoptees were there as well, as an organized event by AKASF. I recently received an email from my friend Saebom, who is a Korean adoptee doing a research study on the experiences of Korean adoptees. This is such an under-studied topic, and I think it's so important that Korea adoptees are starting this research. Please help out if you can, and feel free to pass this information along! Please respond to our independent research study! There are only 49 questions, and it should take 20-30 minutes. Email us for the password at 2curiouskads [at] gmail com, and then proceed to this link: http://www.kwiksurveys.com/online-survey.php?surveyID=BIDNH_636365b6. Be sure to enable cookies before you start so you can go back later on if you need to. Some of these questions might seem personal, but the more open and honest you can be the more helpful your responses will be for other adoptees. Please know that your responses are generated anonymously. Feel free to post this message on your own blog or copy, paste and email it to anyone who might be interested in participating. Or simply email us at 2curiouskads [at] gmail com, with a list of emails, and we'll be happy to send out the information. Here’s some info on us. We are Korean adoptees, 32 and 35 years old, who've been Korea 2-3 times. After we returned from Korea last year we felt isolated. Displaced. Confused. Unable to ease back into our pre-Korea lives. We wondered if other adoptees felt the same way. More importantly, if they didn't, what had they done to prevent these feelings from manifesting? What sort of foundations, behaviors, life circumstances did they have in place that enabled them to feel rooted and connected when they returned? And how could this information offer support to other adoptees? This is where you come in. If we get enough responses we will develop the results into a presentation for the IKAA Gathering in Seoul this summer so that your responses will help others just like you. Yesterday, the New York Times published a story profiling the trials of the South Korean single mother. It is truly heartbreaking to read what these women sacrificed in order to raise their own children. Even when faced with a declining birthrate, it is more acceptable to have an illegal abortion or to give up a baby for adoption than to live as a single mom. It is especially infuriating, considering how much pressure is put on Korean mothers in general to be the sole caregivers, that these women are roundly shunned when they should be applauded for taking full responsibility for their lives and the lives of their children. Sadly, my family has some personal experience with this cultural stigma. My cousin's husband was tragically killed in a car accident when their daughter was only 8 months old. She tried to raise her daughter alone, but eventually word got out to her daycare provider that there wasn't a father at home (her employer already knew because she was employed both before and after the accident). They confronted her quite rudely, and when she explained with great pain what had happened, they had the gall to call her a liar (as in "Of COURSE you're going to say that your husband is dead, that's what they all say"). Because of this and similar experiences, she eventually moved to the United States. If widows get this sort of treatment in the motherland, I am not surprised that straight-up single moms get it much worse. That said, I applaud the 40 women who have joined the unwed mothers association thus far, and hope that as South Korea further establishes itself as a modern nation, these last few shameful vestiges of pigheaded bigotry can be laid to rest. We found your birth father! Oops, no we didnt. My fellow Los Angeles mom blogger Amy Anderson flew back to Korea yesterday for the first time since she left thirty-six years ago as an infant. She was selected to go as part of Overseas Koreans Foundation's "First Trip Home" project. 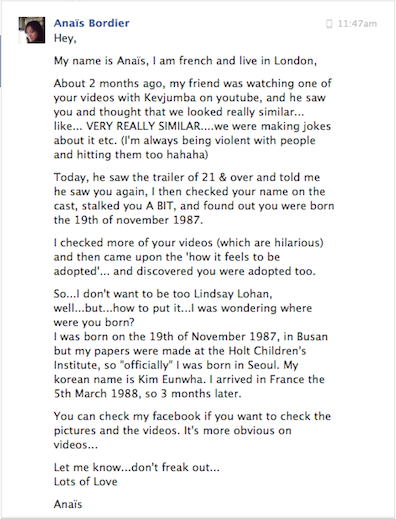 She is a Korean adoptee. Amy's a comedian, but her recent post about the lead-up to her trip brought me to tears (and not from laughing). Long story short: she was sent an e-mail from a social worker saying they had found her birth father and he wanted to meet her during her trip, but then she was sent another e-mail a little over an hour later saying that that previous e-mail had been sent to the wrong person. The dreaded has occurred. I spent the past two months fearing it, guarding against it, shutting myself off from hoping too much, from imagining the face of the little thing. Then it happened, and I stand helpless in the face of it. I was pregnant for the past three months, and now I am not. And there is nothing I can do about it. In the face of this loss and this feeling of helplessness, I wonder what I should do. I could wallow, cry, rant that it's not fair, and cry some more. I have done some of that already. But I don't want to be buried in it. I am sure it will drown me like quicksand, slowly sucking me in and absorbing me, even though I may not feel the changing depth minute by minute. I know grief can consume me, and I'm not ready to befriend it so quickly. I thought this might be a good time to re-introduce myself to everyone since I’ve enjoyed reading the introduction posts by our new Kimchi Mamas and the re-introductions by some of the other KM’s. I went back through the archives and discovered that I’d never really written an introduction post when I first joined the blog, so here goes! I am a mama to two hapa kids, a daughter who is 14 and a 10-year old son. I’m a social worker, and currently work at a non-profit agency. I will soon be re-entering the university as a Ph.D. candidate in Social Work at the “seasoned” age of 40! I joke that I’m making up for time, as I spent most of my 20s and half of my 30s starting and dropping out of college and 8 years of being a stay-at-home mom. Oh, do I wish I’d had a Kimchi Mama-type group back then! I can only guess as to my origins of birth – I know it was likely somewhere in the Daegu area of South Korea, sometime probably in 1968. The reasons for my unknown birth information is that I was found abandoned on the Daegu City Hall steps in a box, wrapped in quilts, in February of 1970 and I appeared to be about a year old. According to the city hall records, I had a note with my name and birthdate pinned inside my jacket which would have made me 14 months if accurate. I was immediately whisked off to White Lily Orphanage, run by the Catholic Church, in the city. I lived at the orphanage for 5 months before being transferred to another orphanage in Ilsan (closer to Seoul) where I stayed just over a year before I was placed on an airplane and flown to Minneapolis, Minnesota where I was picked up by my adoptive parents. I was just under 3 years old.